From scratch recipe, but still easy to make! It's the perfect moist and dense chocolate cake! A few Sunday’s ago I was craving some really good chocolate cake. I’m talking about some fabulous tasting made from scratch chocolate cake! So I came upon this highly-rated recipe on AllRecipes.com and made it two Sundays in a row. In fact, it made an appearance at our Easter dessert too! (No, it wasn’t pretty and pastel, but man it tasted good.) Even just a few days ago, my husband praised it as the best chocolate cake recipe I’ve ever made! What’s So Great About This Chocolate Cake Recipe? Well, it’s got simple ingredients and it’s easy to make! What’s there not to love? If you frequently buy Hershey’s products, you may already be familiar with this chocolate cake recipe. That’s because it’s the recipe that’s on the back of the Hershey’s unsweetened cocoa container! If it’s from Hershey’s you know it’s going to be good. I usually keep it super simple and make this cake in a 9×13 baking dish or pan. If you want a more fancy cake, this recipe works well for two 9-inch round cakes. I like to use the convenient Evenbake Cake Strips when I do a layered cake to be sure the layers bake up evenly and flat. I totally want to try this recipe for a special occasion as a double-layered chocolate cake with the chocolate buttercream frosting and maybe some mini chocolate chips pressed into the sides. Yum! You can make about 30 of them with this chocolate cake recipe! Adjust the baking time and you’re good to go. The buttercream frosting is PERFECT for frosting cupcakes, especially with cupcake frosting tips. Since this chocolate cake is so moist and flavorful, you can definitely get away with no toppings at all. However, if you are going to go with some sort of topping, chocolate buttercream frosting or whipped cream are definitely yummy options! If you decide to go the frosting route, we find it really tasty if you warm up the frosting in the microwave for 15 seconds, then pour it over the top of the cake! Try it out! If you like the berry/chocolate flavor combo, try berries or cherry pie filling with some whipped cream topping on top. Or, check out all of our dessert recipes here! Preheat oven to 350 degrees F. Grease and flour two 9-inch round cake pans or grease a 9x13 pan. In a large bowl, stir together the sugar, flour, cocoa, baking soda, baking powder, and salt. Add the eggs, milk, oil and vanilla, mix for 3 minutes with an electric mixer. Stir in the boiling water by hand until batter is well combined. (The batter will look runny, but have faith... it'll turn out!) Pour evenly into the prepared pans (or pan). For two 9-inch cakes, bake for 30-35 minutes, until a toothpick inserted comes out clean. For 9x13 cake, bake for 40-45 minutes. For two 9-inch cakes, cool cake for 10 minutes in the pans, then remove from pans to cool completely. The cake is delicious by itself, either slightly warm or even chilled. Try it with the chocolate buttercream or whipped cream topping. Add some berries or cherry pie filling with the whipped cream, if desired! With an electric mixer, beat the butter until creamy, about 2 minutes. Add the confectioners' sugar, cocoa powder, milk or cream, salt, and vanilla. Mix together on low speed. Increase to high speed and beat for 3 minutes. If frosting is too thin - add up to 1/2 cup more sugar. If too thick - add another tablespoon of cream or milk. Yield: 2 1/2 cups. Cupcakes: Fill about 30 cupcakes liners in muffin pans to about 2/3 full. Bake at 350 degrees F for 22-25 minutes. I’m excited to see recipes like this on your site 🙂 I’m trying to get away from the ‘boxed’ desserts, but still want to do things frugally, so this helps. Thanks! This recipe for the cake is off the back of Hershey’s Coca. Same exact 1!!! The best chocolate cake reciepe EVER! Cant wait to make it again and serve it with ice cream! OMG!!! My wife does most of the cooking in the house (only because she wants too, not because I can’t or won’t) 🙂 But I’ve baked this cake twice and she loves it!!! Now I’m stuck baking this cake for her and parties. 🙂 It’s soooo simple but soooo delicious. Thanks for the recipe. We actually buy the Chocolate Butter Cream Frosting, but it is a nice compliment to an already delicious cake. Nice!! Glad you enjoyed! 🙂 Thanks for sharing your results! This recipe looks really yummy!….If you ever want to try another one go to daisybrand.com for their sour cream chocolate cake and chocolate frosting!! To DIE for!!! Just made it last night and I use whatever sour cream I have on hand. Oh, that sounds YUUUMMMYYY! I just may have to do that. Thanks Lindsay! Thank you! Homemade cake isn’t complicated like most think and tastes so much better then box! What a great tip! I’ve stopped adding choc chips to my cakes and cupcakes because of that very reason (falling to the bottom). Thank you – I’m going to do this next time! Thanks for the “dusting with flour” tip! Here’s a great peanut butter cookie recipe. This sounds weird but trust me!! It’s called “Three Ingredient Peanut Butter Cookies” 1 cup white sugar/1 cup peanut butter/1 egg. That’s it! Mix it all together and drop by teaspoons on your cookie sheet. Bake @350 for 8-10 mins. They will be very soft and tend to “LOOK” a little raw but after cooling completley these are amazing!! Of course I double the recipe! If you like you can do the fork criss cross thing on top before baking and these are also Gluten Free. Very Frugal by the way!!! Thank you Meg! We tried this and they were delicious! Thanks for sharing! I love these. My Grams made them and we called them Cuppa Cuppa Egg peanut butter cookies!!! Homemade peanut butter or skippy? Haylee – did you make it? Sorry I didn’t see this sooner. It’s not hard to make at all. My 13 year old and 11 year old do it together. Good luck! I found this recipe doing a general Google search because I wanted to try my hand at a simple chocolate cake from scratch [my first!]. I used the batter for cupcakes and baked for 20 minutes, and they came out perfect. My coworkers loved them, too. Thanks for this! Yay! I’m glad you found it! We are one day post Hurricane Sandy and although we were blessed to not lose power being in the woods and all, I am feeling we need a little treat-my husband and kids and I. Looking forward to this cake today! Yay April! So glad to hear it! Just took it out of the oven, put a chocolate glaze on it and can’t stop sampling it from the pan! Kids LOVE it! Thanks so much for this! So happy to hear this April! Me and my son made this today and hands down the best chocolate cake I have had in years. Super easy and so very moist. I made a semi sweet scratch frostng to go on top that really balanced well. Thanks for the recipe, I am always looking for great scratch recipes to add to my arsenal. Oh that sounds good Jennifer! Would love the recipe! I add 1/2 tsp of cinnamon to the dry ingredients, yum! Glad you were able to give it a try! This is the exact same recipe as on the side of the hershey’s cocoa box …. Wow! I didn’t know that, I found it on allrecipes.com and LOVE it! P.s i loved it , it inspises me alot …. The cake itself was not what I was expecting and neither my husband nor I liked it better than a boxed cake, but I did like the frosting. The texture was just not as fluffy as I like cake. If you like a fluffier cake you can try whipping the wet ingredients instead of just mixing them. Then you can mix the dry ingredients in normally. I also use cream instead of milk and butter in place of oil. It adds more calories but honestly, it is chocolate cake lol! I’m baking my first homemade cake this Friday for my sister’s birthday party Saturday! I’m using this recipe for both the cake and frosting! I’m excited to make it!! I’m thinking it will be loved by the family! Yay! Let us know what they think! Thanks Cathy for the conversion calculator it really helped…. Do you recommend dip and scope method or spoon and level to measure ingredients for this recipe..
I’m not to fancy abt my measurements. I usually just dip my measuring cup in, scoop it out, shake it a bit, and then level it off. 🙂 Good luck! I just made this and used organic coconut oil in place of the vegetable oil. Didnt frost it, just mixed a little powdered sugar and cocoa and dusted the top. BEST chocolate cake ever – so good! Thanks for sharing Grace! I love to use coconut oil as a substitute in my recipes. I used peanut oil and almond oil as substitutes-pnut oil worked great, almond not so good-I’m going to try almond/peanut combo next time. This is the BEST scratch cake I’ve found yet. This cake was unbelievably good. I actually took it to a dessert party, untested and untried, and didn’t acknowledge that it was mine (just in case it was awful!) People were going nuts over it! I didn’t use your icing … the 5-1/2 cups of icing sugar kind of put me off, so I found another recipe online and adjusted it with less icing sugar and more cocoa. And it was just perfect. Yes, I decided I don’t care for that frosting either. Glad you found something better! I love this cake recipe and I use a chocolate pudding (or mousse box mix) frosting. It’s super simple and quite light. For the extra chocolatey goodness!! 😀 My favorite is adding crushed fruit on top of it. I’ve used blackberries, raspberries or strawberries and they are all delicious. yum yum. Mix the first two, then add the sugar, last add the cool whip. Oh that sounds divine Sarah! I’m going to have to try that next time!! Thank you for sharing! Oh my goodness! I may have to do that tomorrow!!! My mouth is watering now! I forgot to add that the above pudding frosting is made for the cake to be eaten in a day if you spread it on there. Otherwise what I do is make it and store it in a container, spooning it out onto the cake upon eating. Oh, great tip. Thanks again! Yeah no wonder it’s good because it’s got 2 cups of sugar in it. The cake is easy to make but it exploded in my oven. I advise you to watch the cake very well and do not use a 9×12 pan in the oven it overflows. as for the exploding cake-use a cookie sheet to catch run-over but most of all, I found this makes enough batter to do (2) 9 inch rounds and one 8 inch-fill the pans NO MORE than 1/3, 1/4 really works best-if they run over they vent the gas and don’t rise properly-use this method for a fluffy cake! Decided to make a cake for my wife’s birthday. I halved the recipe and used one 9×9 pan. Luckily I was reading through these comments and saw someone saying it went all over the oven. I had thought it looked pretty full in the pan… I checked it at about 17 minutes in and, yep!, it was right up to the edge. I got a cookie sheet under it and a few minutes later, it is indeed all over! I don’t care, I am sure it will be so good that it won’t matter a bit. And I get dibs on the drippings off the cookie sheet, too. That’s a bummer! I don’t understand why this is happening to either of you. I make it all the time in a regular full sized cake pan with no issues at all. I find that interesting. I have made this cake for years and years and years 🙂 in many different size pans. My sister and I use to do cake decorating. I have put small amounts in cupcake, 6 inch and double plus in large sheet cake pans. Sorry for your failure, don’t give up. Too great of a cake not to make it. I have been making this cake for years. It is from the Hershey’s Cocoa container. And I think the frosting may be too. It is called Hershey’s Easy Does it Recipe #11. But will say it is the best chocolate cake recipe ever. Yes, best ever!!! This is my all time favorite Hershey’s Chocolate Cake. I only use a half batch of the frosting on the Hershey’s can. Dark chocolate cake with creamy icing, wonderful and very satisfying. I love baking from scratch and have never enjoyed using the box recipe because I baked with my grandmother and mother from the very beginning. You were right that the batter looked a little runny, but it did pull through!!! So excited that I found such a delicious cake mix and an easy buttercream frosting. Thank you so much! Will definitely be making it again. Comb. first 2 ingred., add butter, boiling water and vanilla. Beat with an electric mixer on low til combined. Beat for 1 min. on medium. Cool for 20-30 min or until mixture reaches spreading consistency. I made this cake for dessert last night to thank a friend for helping us out when we were away. My friend and everyone else that tried the cake LOVED it! They all said that it was the best chocolate cake that they have ever had!! Thank you. You’re welcome! My mouth is watering for it right now! I love making things from scratch, it’s nice to not have all the artificial stuff. This recipe looks so good! Followed this to a T. Absolutely delicious!! Looking for a good chocolate whipped cream frosting recipe??? Any suggestions? Mix the first two ingredients according to the box, then add the sugar, last add the cool whip. Thank you Sarah! That looks (and sounds) delish!! Hello just want to say I made this recipe for the cake and I came to the baking power and found out I didn’t have any so I looked online what I could use in place of it. Some web sites told me how to make my own others said it can’t be substituted, then I found one site that said instead of baking power that u could use baking soda. So that’s what I did I thought what the heck do I have to loose so I put 1 in a half teaspoons baking soda in it and another 1 in a half teaspoon baking soda in it to substitute the baking power. Let me tell you the cake came out excellent. Thanks for the easy recipe I will be making this more often. Yeah! I am just learning how to bake. Thank you so very much. Hey, instead of using the unsweetened cocoa powder am I able to use nestle cocoa powder. Will it taste the same or will it look different? I am mean the nestle nesquik chocolate cocoa powder*** will this affect the cake? Nestle Nesquik Chocolate Cocoa Powder wouldn’t work for this cake. You’ll want to get the cocoa in the baking aisle. Good luck! About how much cake does this make? I’m wanting to make a double layer cake. Should I double the ingredients? If you use two 8″ circle pans, you should be fine. Woo hoo!!! Way to go! it makes it more rich! Oh yum! That’s a great idea! I’m only 12, and I just started getting into baking. This was my first time making a cake from scratch, and it came out great! Thanks so much for the recipe! Woo hoo! Glad you enjoyed it! How many people does this serve? I want to know because my mom’s birthday party is in two days and I think this might be the cake we’re looking for? Also, how good is the buttercream frosting, on a scale of one to ten? Her favorite frosting is butter cream so I want to make sure it’s a good one. It’s a regular cake pan. So probably 15-20 depending on the size. The frosting is creamy… Just a little too rich for my personal taste. If she’s a fan, she’ll probably love it. Good luck! Let us know how it turns out! The cake turned out great! Everyone loved it, and the frosting was DELECIOUS. I just now ate it! Thanks! Awesome! So happy to hear it! I found your blog by doing a google search as well. I made this for my son’s birthday. This chocolate cake recipe is THE best I have ever made! Thank you! I am going to make it again right now for a baby shower! I made this cake this evening for my spouse’s birthday tomorrow. Couldn’t have been easier. I was a bit concerned at how wet the batter was, but the cake turned out light and super moist. I actually cut the sugar down to 1 1/2 cups. And I only used 1 cup of cocoa in the frosting. Great tip – thanks Moe!! You’re right, the runny batter is scary! Glad you loved it! I just made this, it was super easy! I substituted 1/4 cup coconut palm sugar, and reduced the sugar (I used raw sugar) to 1 and 1/2 C. (1 3/4 cups total sweeteners) I used organic coconut oil for the vegitable oil. This just may be the best chocolate cake I have ever made! I topped it with homemade organic raspberry jam and real homemade whip cream. Yum! I just want to say that this is a Hersey recipe from an old cookbook that I have had for 30 or more years. It is also on the Hersey web site. I find it all the time on the net that stuff is republished without the original people given credit. I know that you thought it was from allrecipes.com, but someone took the original and published it as their own. Can you use 25 cm round pan for this? How do you bake it using only one cake pan? and how long should it takes? (For the 9×13 cake pan I baked it for about 42 minutes… do the toothpick test, it should come out fairly clean). So using one 25cm round pan for around 45 minutes is fine? And how many should you put inside to prevent it from overflow? Sorry, I’m really bad at this. A 25cm round pan is equal to a 10 inch round pan. The recipe calls for the mix to go into TWO 9 inch round pans. So you definitely can not put all the batter into just one 25 cm pan. I’d put just half of it in there and then bake it for 25-30 minutes, or until a toothpick comes out clean. WOW CHOCOLATE CAKE SOUNDS GOOD RIGHT NOW!!!!!!!!!!!!!!!!!!!!!!!!!!!!!!!!!!!!!!!!!!!!!!!!!!!!!!!! Good morning. Looking for different “from scratch” recipes and came across your chocolate cake recipe. I’m curious, does this amount equate to that you would find in the typical box of cake mix. I have a few recipes up my sleeve using cake mix that don’t require any other added ingredients except for example, just a can of pumpkin puree. Using just the dry ingredients from your recipe above, do you think the chocolate cake mix would work the same? Trying very hard to eliminate as much processed and “junk added” food as possible and would love to add from scratch cake mix to my repertoire! Hi Kim… I’m not a guru cook, but I would think you could give it a shot! The batter is runny when made correctly… so keep that in mind. And let us know how it does! Made this cake for my sister-in-laws birthday a few days ago and oh my goodness! It was amazing! I made a big batch of chocolate mousse from scratch, took half of it and mixed with soft butter. The butter cream I put between the layers, and the rest of the mousse I mixed with chocolate chips and spread a thick layer all around the cake. It is hand down the best chocolate cake I’ve ever made! Reading the comments I now understand how common cake from a box is in the States, here in Sweden it’s very uncommon. I’ve actually NEVER made cake from a box… In school (homeschooling is illegal, and the basic curriculum is the same for public and private) we learn to bake already in 1:st grade. Thank you for a wonderful recipe! I’m so glad you liked it! It one of our favorites! This cake is in the oven right now. I had to make it for my sister’s bakesale; but I was happy to do it. I bet it will be a huge hit. Thank you so so much for sharing this recipe. Wish me luck…making this this weekend for my niece who asked for a chocolate cake for her birthday, although she specifically asked for cream cheese icing. Her mom wanted to do a box cake, but I convinced her to let me do scratch. Let us know how it turns out with the cream cheese frosting! Hi Krista, I suspect it’s just like any other cake mix from a box… probably makes right around 24 depending on the size. Happy birthday to the little guy! Today I was preparing a box cakefor my father-in-laws birthday & I decided to do a search for scratch chocolate cake. I saw yours & all the wonderful comments. I’m excited to try it! The next family birthday will be this recipe. The frosting recipe is the same as my mother’s. I want to get away from boxed items & this looks so easy. Thank you! So I just made this cake last night and I boiled the water but forgot to put it in!!! Ahh!! I realized too late and the cakes were already in the oven so I just let it go and hoped for the best. They were amazing! It was like the love child of a brownie-cake couple. Today, however, I have noticed that it was drying up a bit in some areas, which the water probably helps with, so I will be adding the water for sure next time! Thanks! I am making this cake as we speak, and I filled my pans half way and they both spude over in my oven and almost caused a fire. I then put them on a cookie sheet and they are still in the oven I hope they are as good as you say they are. I did exactly what your recipe asked for. I don’t know what happened!!! I am putting a peanut Butter frosting on mine if it turns out ok.
With less than 4 hours notice, I was asked to make a cake for a birthday! This was the first recipe that came up on my google search for “chocolate cake from scratch”. The stars must have aligned because I had everything in my cupboard not to mention some ready made chocolate frosting I didn’t end up using for my Christmas baking. It’s in the oven as I type but my only concern is the 9inch spring form tin I used as I had no other tin! Watching it like a hawk! May this work or I shall be forced to get a store brought cake. Thanks for sharing! Thank you for this receipt is was so easy to do. My daughter who has Downs was begging to make a cake and I didn’t have any cake mix. This was the first one that came up when I googled it and she was able to make the cake by herself with a lot bit of help form me. I only helped with the measuring and putting in and out of the oven she did everything else herself and was so happy to be able to do this. She is only 8 years old. Again thank you for posting this receipt. Oh my goodness… that frosting sounds divine! What’s the recipe? I have a love of peanut butter at the moment! I am planning on making cupcake cones for the bake sale at my son’s school this week. The recipe calls for filling ice cream cones with prepared cake batter from a mix and then baking them. Since the batter for this cake recipe is kind of runny, will that affect my ability to use this recipe for the cupcake cones? Hmmm, tricky. If you have time, I would do a practice batch before the big day. Please let us know what you find out! one of my many resolutions was to make a cake from scratch. On a whim I came across this recipe and made it within the hour. It. Was. DELISH!!! – so right you’re right. I held back on the cocoa like you suggested. Nothing compares to the texture of the cake. It’s amazing. Dense fudgey wonderness. Thank you. I will keep this in my arsenal. I’m going to cool whip and strawberry this cake up again soon!. This is the Hershey “Perfect Chocolate Cake” recipe, straight out of their cookbook/website. It’s a long time tried and true recipe that I’ve been using for years. The only thing I do differently is instead of boiling water, I use black coffee. It enriches the flavor of the chocolate. You can’t taste the coffee, it just tastes more chocolately. It really is the perfect chocolate cake and always turns out perfectly for me. I’ve made it so often over the years that I have the recipe memorized! Yes! That’s what I have since learned thanks to some nice comments (see below). I found it on allrecipes. I’m not a coffee drinker but I bet a future viewer will find your tip useful! Thanks! Would substituting brown sugar and whole wheat flower work as well?? I’m not sure. If you try it will you let us know how it turns out? I just tried this recipe for the first time and my husband is RA’VING about it! I used brown sugar and “self rising” flour and it is great! With the self rising flour i didn’t need the Baking Soda or Baking Powder. This recipe is printed on the back of the “Hershey’s Cocoa Can”. 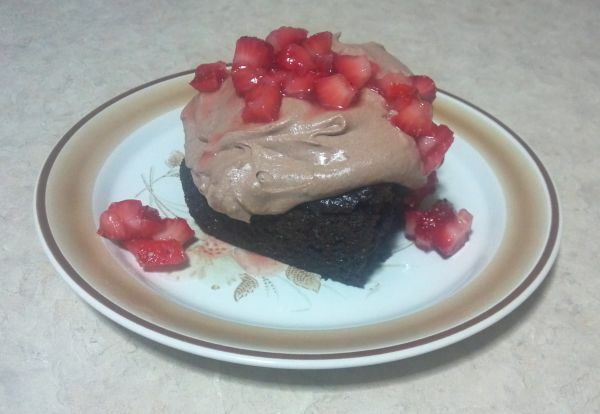 I made it with the”Perfectly Chocolate” chocolate Frosting and it is divine! Thanks Brenda! Yes! That’s what I have since learned thanks to some nice comments (see below). I found it on allrecipes. Thanks for the frosting tip! Hi! Im a beginner in baking. What cocoa powder did you use? Dutch processed or natural? I just use Hershey’s cocoa. Or any brand of powdered cocoa. Does that help? Wondering if I could use this recipe for brownie cookies? I usually use boxed cake mix for them but I like that I already have everything on this list at hand and I’ve been wanting to come up with a homemade recipe! Tips or tricks? I know the oil/egg/water measurements are different just wondering if it would still taste as great? I’m not sure what you’d need to do to adjust ingredients… The batter is normally very runny and there is no way a cookie would form. Thank you for sharing! Glad to hear it baked up nicely for you! Let us know how it turns out! Hmmm, I wonder if you had a rancid ingredient that was added? I’m surprised because this cake gets nothing but rave reviews. Sorry to hear you had a bad experience! Hi Cathy, I’ve been trying to bake this cake twice and follow the recipe trough and trough. I bake in 10 inch baking pan. I ended up failing. The second cake, after I baked for more than hour, it still sticky and runny, it didn’t even able to frost, Although the toothpick test showes a good result. But the bottom of the cake is hardened. Anyone know why it happening? I really love the taste and want it to frost and decorate it. Jesse – are you using a 10×10 pan or a 10″ circle pan? If so, you’d want to use two of those. I’m not sure why you’re having those issues. Are all of your ingredients fresh? It could be your pan, or could be the oven even? Do you have any issues with your other baking adventures? Sorry to hear it didn’t work for you. What size was your pan? This is hands down the best cake I have ever made. The icing was like the chocolate filling in a donut or something ! Thanks so much for sharing. Is there a recipe like this for white cake or yellow? I loved this recipe! I made it for my husband’s birthday and it was sooooooooo good! We had just returned from a camping trip and didn’t have time to rub to the store and get a cake mix/frosting. Found your recipe and it saved the day!!! I made this cake the other night because my kids have been begging for a cake. I refuse to by boxed cakes because I think they taste awful and I hate those horrible icing cakes you get at the store. This was a winner, I myself even ate the cake and I never touch the stuff, thank you for sharing!! I am happy to report that this cake is soooo moist and delicious, I did not even put icing or anything on it!! I haven’t made a cake from scratch in years. I ran across this recipe but used store bought icing. I wish I had made the icing too but the cake was awesome!! This will be my go to recipe from now on. Thanks so muvch for posting it. Oh, I used a bundt pan and it turned out great! Thanks again!! Great tip about the bundt pan, thank you! I just made this cake. I put it in a 9×13 cake pan. Let me tell you. It looks wonderful all over the bottom of my oven after it overflowed…. That’s so odd Jenny. I’ve made this so many times and have never had an issue! Can I use cowhead milk? Can I substitute canola oil from veg.oil? I’ve never heard of cowhead milk, so I can’t help you on that one. But using canola oil instead of veg oil is no problem! Yep, the batter is runny in this recipe! But sooo good! My husband is always wanting chocolate cake but it’s hard to find the time! I made this on a whim last night (much to my husband’s joy) and I have to say, I was blown away. I knew it had to be an older recipe, given the amount of sugar in it, so I just decreased the sugar and kept everything else the same. (My daughter and I laughed at how terrible it looks when you add the boiling water) but popping out of the oven…oh my. It smelled amazing and once we finally got to frost and eat it, it was amazing. I had store bought fudge frosting that we decided to put on top, so I was glad that I decreased the sugar in the cake. It all balanced so perfectly. This will be our favorite cake from now on. It’s been so long since I have found a cake with such perfect texture- especially chocolate cake. Pauline, so glad you found it and enjoyed it! I’m curious how much sugar you used… sounds like an excellent modification! So glad to hear! This is one of my favorites too and it is so easy!! Made this cake last night. It was so moist and delicious. You won’t be disappointed with this recipe. I have made this cake twice and those r very nice. Me and my husband just loved it. But now i want to bake some cupcakes for my toddler.can u plz help me with that tooo?? Fill cupcake liners about 2/3 full and bake at 350 degrees for 22-25 minutes! We tried it and I loved how the cake came out. It was very very delicious! However, I tried making my own confectioners sugar and I think I messed up with it to do the frosting… It was very crunchy with the sugar crystals 🤦‍♀️ I’ll have to stick with maybe store bought frosting instead or have confectioners sugar on hand for this.